PT Chandra Asri Petrochemical Tbk tidak pernah memungut uang atau pembayaran dalam bentuk apapun terkait proses perekrutan calon karyawan kami. Kami menghimbau masyarakat agar berhati-hati dan mewaspadai adanya modus penipuan dalam proses penerimaan calon karyawan yang mengatasnamakan PT Chandra Asri Petrochemical Tbk. We believe that our people are one of our most valuable assets. We assure our employees’ welfare, through providing various facilities ranging from healthcare, safety assurance, personal development programs and even further to opportunity like scholarship. Scholarship is company assistance final semester college students as company awareness program in education. Each grantee shall to follow compulsory working at company for maximum 2 years. Scholarship is provided in form of Education Assistance for 2 semesters and 12 months allowances. Management Trainee (MT) is a special program that aims to prepare the fulfillment of employees' demand who have the potential for good performance of the best candidates are selected by particular selection process. Work at the heart of our business, Chandra Asri's Manufacturing team ensure compliance in all aspects of production flow. We specified the workforce into several units; Production, Maintenance, Engineering, Planning & Optimization, Quality Control, Process Technology and SHE (Safety, Health and Environment). Be part of our frontliners! Chandra Asri's Commercial team provide direction for customers to the right products through various functions, ranging from Research and Business Development, Technical Service, Sales, Logistics, and Procurement. Boost our business excellence by become part of our Corporate team. 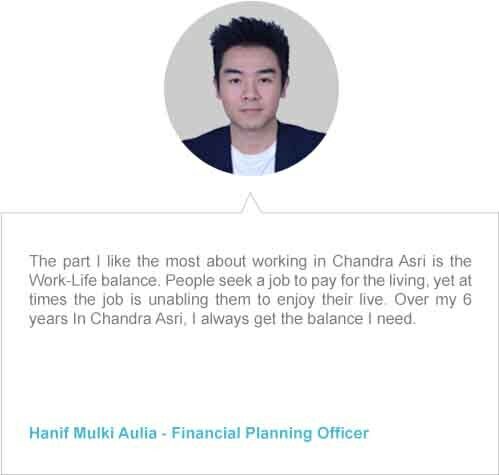 Join the team of Finance, Compliance, Corporate Affairs, General Affairs, Human Resources, Internal Audit, Legal and Information Technology to inspire and nurture the best practice of corporate governance in Chandra Asri. Be the first one to know when we have the right opportunities for you. Chandra Asri recognizes the importance of talent and committed to discover potential assets through our scholarship program. We offer a set of benefit that comprises of financial assistance, living allowances and a career in our company. 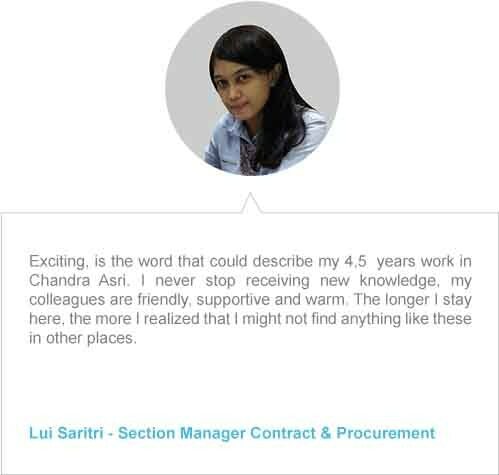 Chandra Asri provides a platform for curious young minds to explore various field of work, unlock their potentials and help them grow before entering the professional circuit. Aware with the importance of sustainability in business, Chandra Asri collaborates with Ministry of Public Work and Public Housing (PUPR) to implement asphalt plastic road within its 6.372 m2 plant areal in Cilegon.